Printing through a USB lead or a network cable is a comparatively simple job, as both PC and printer know what they're connected to. It's not nearly as easy, however, with a wireless link. In an ideal world, any wireless device would always be aware of any printers in its vicinity and able to print to them on command, while the printers would be happy to print any data stream they detected. There's just one fly in the ointment – security. You only want 'legitimate' devices to print to your printers and you only want authorised printers to respond to a print request. In a business, it has to do with accounting and paying for the prints through the correct cost centre, but even in the home you may want to restrict who can use a given printer. So, the ideal wireless print protocol should make it easy for approved devices to print to approved printers, but hard for unapproved ones to do so. There have been a number of solutions to this problem, with varying degrees of success. This is an umbrella term for a range of technologies from HP, but an ePrint machine is usually defined by its ability to print emails and attachments sent via the cloud from mobile devices. Each ePrint printer is assigned a unique email address to receive the messages directly rather than through a connected computer. Security is maintained through the random generation of email addresses for ePrint printers; unless you know a machine's address, you can't print to it. As owner of the printer, you can also maintain a whitelist of approved users. If you're using ePrint to print to a local printer – for example, in the same room – it can take longer than would a direct connection. The email has to go up to the cloud, be rendered at HP's ePrint Center then returned to the printer for processing. The facilities provided by ePrint are basic, with minimal control over the size of any printed image and none over the number of copies printed; you get one per email. Under the same umbrella is ePrint Wireless Direct Printing, which provides many of the same facilities as other Wi-Fi Direct printing devices. HP worked with Apple in the development of AirPrint, which it sees as being part of the ePrint family, although Apple might take a different view. This technology was introduced in 2010 to address the problem of some Apple mobile devices not being able to print easily through other means. It connects an OSX or iOS device to a wireless printer via the router in a wireless network. It doesn't connect directly between device and printer. The main advantage of AirPrint is that you don't have to install drivers for a specific printer before printing. 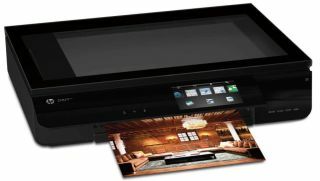 As long as the printer is AirPrint compatible – pretty much all HP printers, and most modern ones from Brother, Canon and Epson – you should be able to use AirPrint with it straight out of the box. When you come to print, you're presented with a list of printers your device can currently 'see'. Once you've made the selection the file, which may be a picture or document, is sent via the router. Printing controls will depend to some extent on the application that offers the AirPrint print function, but are generally similar to those using ePrint and fairly minimal. It's also possible to connect a mobile device with AirPrint to some wired or non-AirPrint wireless printers, as long as they're connected to the router and can therefore be accessed from the Apple device. This technology was developed under the Wi-Fi Alliance, a grouping of hardware and software providers, including HP, Intel and other chip manufacturers. It's designed to simplify the connection of Wi-Fi Direct devices and to enable them to communicate directly, rather than relying on a router as intermediary. The technology includes Wi-Fi Protected Setup (WPS), which enables the connection of two devices using either a designated button on one of them, or a PIN code on one or both. It's easier to connect WPS than even to set up a simple Bluetooth pairing. With Wi-Fi Direct, you will typically need a print App on your mobile device for the make of printer you're using. These are usually free as a one-time download and install. The disadvantage is that if you regularly print to more than one type of printer, you'll need a different app for each one. While the WPS setup process for Wi-Fi Direct is a fairly painless one, it doesn't work that well in an office, where you may have several printers of the same make and model within range. Near field communication (NFC) is a new technology beginning to appear in printers – some new Samsung models are set to feature it, for example – designed to overcome this problem. A passive 'tag' is embedded in one device and an active transceiver in the other, both using radio frequency identification (RFID). This makes it possible to transfer details of a specific printer to a portable device, simply by bringing that device close to the printer or touching them together. The Wi-Fi Direct link is then set up for a one-off print without any sign-in or passcode being required. NFC can be used with other technologies, such as Bluetooth, but for printing it's likely to be primarily Wi-Fi Direct. Although wireless connection from mobile device to printer is currently a bit of a mish mash of different procedures and technologies, things are improving, and protocols like WPS setup and NFC can help provide ad hoc connections with no more than a couple of button presses. Check out our round-up of the top 10 business printers here.